Trade currency pairs on Binary Options has become very popular with traders all over the world. Even those who once started trading Forex soon realized that binary options can earn much more and much faster. I invite you to read free signals on currency pairsUsing indicators and technical analysis. They are easy to use, understandable and accessible. They can learn even a novice. For many years, the direction of technical analysis has been formed in trading, and this is not only drawings and figures. Gifted mathematicians developed various formulas, from which additional charts were constructed, called "price indicators." Some of the projects became very popular and deserved universal recognition. Today, almost every trader draws attention to any indicators in one way or another. I in the trade have faced a situation, that if signals too much the schedule becomes full and not clear. Therefore, I decided to pay attention to specialized services and received a more convenient approach to analysis, expressed in a table of signals based on the values ​​of one or another indicator. Take a look at a comprehensive tool located below. You can follow the appearance of profitable signals online. As you can see, there are all the standard timeframes from minutes to 5 1 months. Among the indicators there is a trend (for example, Alligator by Bill Williams, ADX), and oscillators (RSI, Stochastic, etc.). The values ​​of each signal can be checked by clicking on the words: "Buy" or "Sell", In the right time slot. Open a real chart with this indicator in real time. Many will agree that it is incredibly easy, which is why I chose this service. In general, the system looks promising. However, new traders often make the mistake of trying to use all the indicators and timeframes at once. Sometimes signals conflict with each other, it introduces them to a screeching halt, they begin to doubt the quality of the signal. To avoid this, you need to fully assess the market, revealing the background of the trend movement or price consolidation. Let us examine the mechanics of using a complex analysis when trading binary options. Step one. 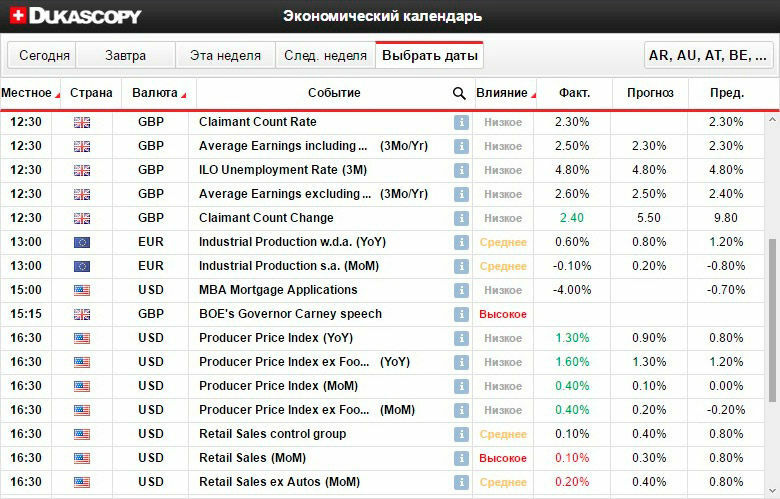 Before you begin to view indicators, I recommend open Economic Calendar And evaluate the news background in the tool that you plan to trade. It is required to find out the probability of forming a strong trend within a day. In addition, volatility in the market may increase when the price is found in historical extremes (highs and lows) or strong levels of support and resistance. Much depends on the time of bidding. Strong movements on high volumes are more common during the European trading session (from 11: 00 to 19: 00 MSC). Thus, the primary task is to understand the current market situation, whether there are prerequisites for a strong movement, etc. Step Two. The next step depends on the circumstances. If there is news, there is an impulse in the market (strong short-term movement), then it is necessary to apply trend signals. Alligator, ADX and SAR are best suited, as well as the less well-known AROON (it can be deleted, just 3). Alligator points to the main direction of movement, when all its lines are crossed in one direction or another. As for ADX, it estimates the strength of the trend, and Parabolic SAR - shows the entry point if the price is really rising or falling. As a result, when all four indicators simultaneously show "Sell" or "Buy", you should enter the transaction in the corresponding direction. Alternatives. Another situation - the market is calm, no news, historical extremes (highs and lows), too. Inside the day there are no impulses, it is probably more convenient for you to trade during the Asian session (night time by MSC). In this case, everything develops in favor of using oscillators (RSI, CCI, MACD, Stochastic), while for insurance it is recommended to compare ADX readings, it is better to have it in the neutral zone. Between the case I will say that ADX is an incredibly useful tool in any situation, almost always when it is lower than 25 in the flat market. Returning to trading, we get a result - if all 4 oscillators show "Buy" or "Sell", and ADX - "Neutral", then we enter the deal. Note. An important issue is the choice of timeframes. Many people heard the idea of ​​the three Elder screens when 3 time slots are applied immediately, the older one evaluates the trend, the younger ones are overbought or oversold by the oscillators. Theoretically, this should work, but in practice I would recommend concentrating on one interval depending on the time of expiration (closing dates) of the option. For example, for options - 5, 15, 30 minutes, it's enough to pay attention to M5 (from 1 to 6 candles), for 60 minutes there is enough M15 (4 candles). If you "wander" through several intervals at the same time, you can get a lot of false signals and skip the right ones. I myself faced such a problem, so I advise you to immediately learn from other people's mistakes. An example of the first. For an in-depth understanding of the above concepts for an integrated analysis of indicators through dedicated service, I make out the theory on the particular situation. As an example, take the most popular currency pair - EURUSD. Consider the recent situation - December 15 2016 years. I have selected for you only the freshest of the transaction (as of this writing), because the market is constantly changing. For example, I had a hard time to study the information on ancient charts. We can see that the euro area was a strong news background, leaving the data on the index of business activity, as well as in the US consumer price index, the information on unemployment, and the day before raising interest rates. In other words, the news a lot and they are all important. Do not try to determine where the market will go on the news, the response is ambiguous, we only state that this day will be an increased interest among market participants. Plus, the euro is at an annual minimum (sample level 1.04624 - 3 extremum December 2015 years), which indicates the likelihood of increased volatility in the day due to accumulation of stops in the area. Now take a look at the indicators. Since we focus on the trend, the trend is applicable scheme: ADX must be greater than 25, Alligator'a crossed lines down, Parabolic SAR is facing downwards. As you can see in the image marked area when the indicators showed a signal when "Sell". It is worth noting that the SAR pretty good filters the signals of the previous two indicators, so do not enter the trade when it does not give the signal. 15 December could adequately rich, looking for indicators on M5 and buying options down Expiry from the 5 30 to minutes. The above trading system provides rare, but a more accurate recommendation to enter into a position. Sometimes, trend movements will occur in full lull in the market. In fact, LEDs can be used in smaller equipment, received a large number of signals, but then winning percentage significantly decreases. Example Two. Consider the case when Consolidation (flat) has been on the market. Just a day before the previous situation - 14 December was "calm before the storm." All investors awaited interest rate decisions in the United States, and no one really selling. As a result, the price of the entire day was in the hallway. Consider the oscillators of the service and their values, as well as ADX. The green marked area when all indicators point to buy or sell. As a result, even in a sluggish day could well earn. It is worth noting that the MACD sometimes gives contradictory information on the background of other indicators, it can occasionally be excluded from the scheme. With proper experience of using the above strategies, the probability of a profitable trade can reach 80-90%. Moreover, in this direction may completely unrestricted development. Some indicators can be ruled out, others added, and so on. To view more conditions for the formation of the trend, to add filters to apply technical analysis and build a channel for commerce. Who shall paint you another option of using technical indicators on the currency pair, it is a little easier. You can follow the appearance of profitable signals right here online. After all, for you, I integrated the table with technical analysis to your site, and it works in real time. Time is indicated in the tables on GMT. Now let's see in currency pairs trading strategies, how to analyze these indicators. 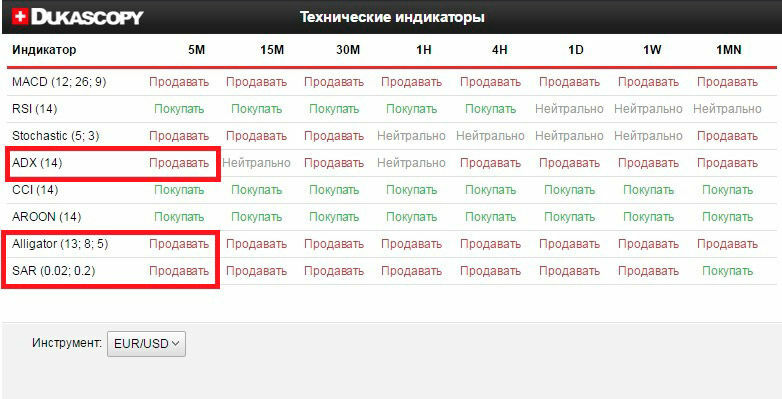 If you see that there is an inscription in front of a certain pair "STRONG BUY" at all time intervals (5 minutes 15 minutes, hourly, daily), it means that the forecast of the change in asset value stable. In the near future this trend will continue, and a pair of price will continue to rise. Therefore it is necessary to buy an option to increase over the next 15-30 minutes minutes. If you see that a certain pair of opposite inscription "Actively sell" at all time intervals (5 minutes 15 minutes, hourly, daily), it means that the forecast of the change in asset value as strong as possible. In the near future this trend will continue, and a pair of price will continue to fall. Therefore it is necessary to buy an option to decrease over the next 15-30 minutes. If the table in front of a currency pair at different time intervals are different signals to the action, the option in any case, do not open. The signal is weak and contradictory. In addition, you can focus on other transactions of traders, which direction they choose to currency pairs. If the percentage of choice over 75%, the tip can be used. I advise you to read also with Binary options trading strategies for trading signals. There you will find guidance on the use of signals when trading indices, commodities and stocks. I want to draw your attention that the value of the currency pairs are very exposed to various economic news. Therefore, opening the option, make sure that in the next minutes 30 not planned news outlet. More detail with Trading strategies on economic calendar news You can see by clicking on the link. You can find himself calendar online. 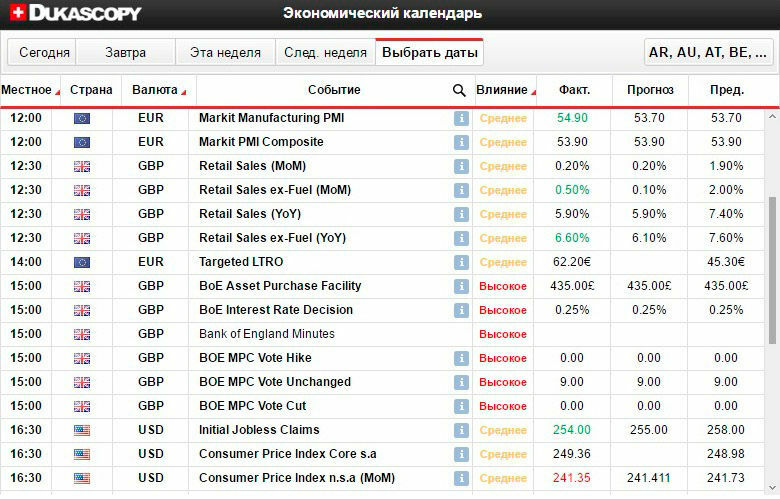 And all the predictions of the currency pairs, based on the economic calendar can be found in the category News. Even more ways to trade the currency pairs are described in the article Binary Options Trading Strategies (Full list).